The South Gauteng High Court in Johannesburg today granted Solidarity’s application in terms of section 77 of the Labour Relations Act, ruling that the National Economic Development Council (Nedlac) must revise its initial decision to reject Solidarity’s application. This ruling means that Nedlac must now reconsider Solidarity’s section 77 application so that all of the trade union’s members at all places of work may lawfully participate in protest action in solidarity with the Sasol strikers and against the exclusion of races in employee share ownership plans. Solidarity Chief Executive Dr Dirk Hermann said in reaction to the favourable ruling that frustration with the exclusion of races goes beyond just Sasol. 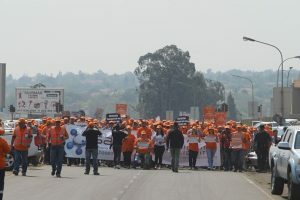 “The Sasol workers are symbolising something so many Solidarity members are experiencing,” Hermann explained. The date of the strike will be announced as soon as the Nedlac process has been finalised.